Madison, Wis. – The Center for Journalism Ethics will facilitate a discussion on “Media after the Midterms: Journalism Ethics in a Contentious Age” at a free public event at 6:30 p.m. Wednesday, Nov. 7, at the Overture Center for the Arts in Madison. 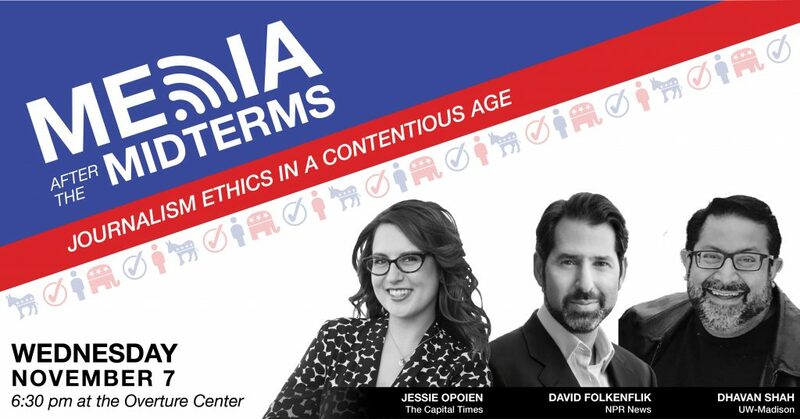 Three panelists with expertise in media, political reporting and the news industry will engage in a public discussion about journalism ethics and the special challenges of covering politics in highly polarized times. David Folkenflik, the New York City-based media correspondent for NPR News and the host and editor of On Point from NPR and WBUR. Folkenflik is an award-winning reporter who writes about the figures who shape journalism and the tectonic shifts affecting the news industry. Jessie Opoien, a reporter at the Capital Times since 2013, covers state government and politics, as well as Madison life, race relations, culture and music. Dhavan Shah is the Maier-Bascom Professor in UW–Madison’s School of Journalism and Mass Communication and director of the Mass Communication Research Center. He researches the influence of electronic and digital media on social judgments and civic engagement. Kathleen Bartzen Culver, James E. Burgess Chair in Journalism Ethics and director of the Center, will moderate the conversation, which will address topics such as declining media trust, changing business models, social media, how partisanship affects both journalists and news consumers, as well as what the future might hold for ethical journalism. The event is free and open to the public. The panel will be in the Promenade Room at the Overture Center for the Arts, 201 State Street, Madison. Folkenflik will be visiting the Center for Journalism Ethics the week of Nov. 5 as part of the Center’s journalist in residence program, an initiative now in its third year. The program brings renowned journalists to campus to promote engagement with UW–Madison students and the public. The Center for Journalism Ethics, housed in the School of Journalism and Mass Communication at the UW-Madison, provides an international hub for the examination of the role of professional and personal ethics in the pursuit of fair, accurate and principled journalism. Founded in 2008, the Center offers resources for journalists, educators, students and the public, including internationally recognized annual conferences exploring key issues in journalism. For information, contact Krista Eastman, Center for Journalism Ethics administrator, at krista.eastman@wisc.edu.